I started using Geocache two days ago, for that reason I downloaded the new Iphone app. I Was looking at the map and noticed that there were caches nearby that had trackables in them. I was curious and tapped on one of these trackables, in the trackable inventory of that specific cache. But whenever I did that (and I did it about 20 times with different caches) the app just closes. You can see the description of the trackable for a split second and then it is gone. 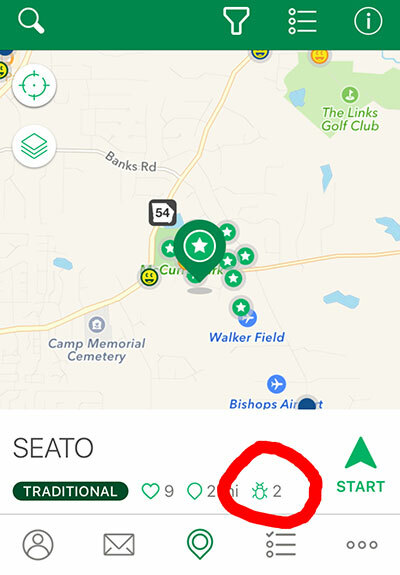 It happens when there is 1 trackable at a cache, but also if there are like 50 at an event. Anyone else had these issues? Or now how to fix it? It might only be fixable by the Groundspeak team, but they might read it this way. Have you uninstalled/reinstalled the App? Sometimes that helps. Can you provide an example? I think I followed the steps you did, but got no crash. I selected one cache, viewed that cache's description to see that Trackables are in the Inventory, selected a particular Trackable's icon, and I can view its mission. It worked OK. But, there may be a bug where Trackables are not updated properly in the App. There's another bug where personal Inventory lists were showing Trackables that were once logged into and Inventory, but aren't currently listed, yet shown in the App. Maybe this is similar. first of all thanks for your time and help! I tried to delete and reinstall the app to see if it would fix the problem. Sadly no result, it still crashes. An example: I searched for the cache in your picture and found it. (Seato, GC27B5Z). I went to the inventory of the cache, still no crash but when I tap on one of the two trackables (either Groundspeak lackey 200, or Mickie frog) the app shuts down. I can see the goal for a split second, and it's gone. Hope this gives you an idea of my problem . I also uninstalled/reinstalled, to check it out. No issues. The Trackables listed in the App for that cache are up-to-date (same Inventory as the web site), so at least for that cache, everything should be fine. Indeed if you do not encounter the same problems then I am not sure were the problem lies. I will send support a ticket, link them this thread, and post their solution here. If you or anyone else knows something I might try; feel free to reply. And once again, thanks for your help!